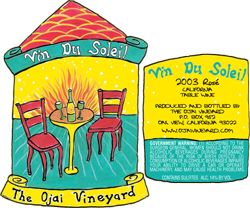 Vin du Soleil is our pet project with obscure Rhone varietals. Each vineyard plot we work with for these wines is farmed with meticulous care. Maybe more than most, these varietals seem only to excel when the crop is tiny, so we intentionally keep the yields low to the point of unprofitability-not a problem because these wines are so much fun to make. The white is an aromatic roussanne and viognier blend, and the red–all from Beckman’s Purisima Mountain Vineyard–is made with grenache, mourvedre and syrah. They’re both delicious alternatives to the norm, and the red ages well.